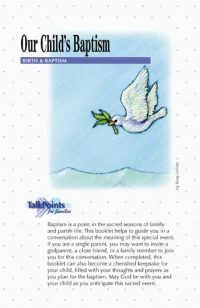 Use individual copies to prepare parents and others before baptism. Give or sell a ten-pack to each family to distribute one to each grandparent, godparent, and others to be filled out and returned. Makes talking about the baptism natural and easy. Each greeting card becomes a keepsake for the child. Includes the larger family and friends in the faith-shaping of a child. Does not replace but supplements what you already use in your baptism program. Inexpensive – 50 cents each ($4.95 per ten-pack). The introduction to this attractive greeting card reads: To all who wish to be a part of this keepsake gift (parents, stepparents, guardians, godparents, grandparents and all other members and friends of the family): The completed pages of this keepsake, filled with your personal words of hope and promise, will someday be read by this very special child. May God guide you in expressing your personal words of love and blessing. The cards come in ten-packs (only $4.95) with the hope that each family will give or send keepsake cards to all who they would like to be included in creating a meaningful keepsake blessing for their child. Order one ten-pack for each family, and invite each family to pay for the cards. What a great way to remind the child for years to come of all those who shared their love and blessing on the day of his/her baptism.